A rapid, screening test for the simultaneous, qualitative detection of Amphetamine, Methamphetamine, Cocaine, Opiates, Marijuana Phencyclidine Benzodiazepines Oxycodone, Methadone, .3 Barbiturates, Buprenorphine, Alcohol and their metabolites in human oral fluid. The Saliva Confirm Fluid Drug and Alcohol Screen Device for AMP/mAMP/COC/OPI/THC/PCP/BZO/OXY/MTD/BAR/BUP/ACL and their metabolites is a rapid, oral fluid screening test that can be performed without the use of an instrument. The test utilizes monoclonal antibodies to selectively detect elevated levels of specific drugs in human oral fluid. Amphetamine is a sympathomimetic amine with therapeutic indications. The drug is often selfadministered by nasal inhalation or oral ingestion. Depending on the route of administration, Amphetamine can be detected in oral fluid as early as 5-10 minutes and up to 72 hours after use1. The Amphetamine assay contained within the Salivaconfirm premium™ Oral Fluid Drug and Alcohol Screen Device yields a positive result when the Amphetamine concentration in oral fluid exceeds 50ng/mL. Methamphetamine is a potent stimulant chemically related to amphetamine but with greater CNS stimulation properties. The drug is often self-administered by nasal inhalation, smoking or oral ingestion. Depending on the route of administration, methamphetamine can be detected in oral fluid as early as 5-10 minutes and up to 72 hours after use1. The Methamphetamine assay contained within the Oral Cube™ Oral Fluid Drug and Alcohol Screen Device yields a positive result when the Methamphetamine concentration in oral fluid exceeds 50 ng/mL. Cocaine is a potent central nervous system (CNS) stimulant and a local anesthetic derived from the coca plant (erythroxylum coca). The drug is often self-administered by nasal inhalation, intravenous injection and free-base smoking. Depending on the route of administration, cocaine and metabolites benzoylecgonine and ecgonine methyl ester can be detected in oral fluid as early as 5-10 minutes following use1. Cocaine and benzoylecgonine can be detected in oral fluids for up to 24 hours after use1. The Cocaine assay contained within the Salivaconfirm premium™ Oral Fluid Drug and Alcohol Screen Device yields a positive result when the cocaine metabolite in oral fluid exceeds 20 ng/mL. The drug class opiates refers to any drug that is derived from the opium poppy, including naturally occurring compounds such as morphine and codeine and semi-synthetic drugs such as heroin. Opiates act to control pain by depressing the central nervous system. The drugs demonstrate addictive properties when used for sustained periods of time; symptoms of withdrawal may include sweating, shaking, nausea and irritability. Opiates can be taken orally or by injection routes including intravenous, intramuscular and subcutaneous; illegal users may also take the intravenously or by nasal inhalation. Using an immunoassay cutoff level of 40 ng/mL, codeine can be detected in the oral fluid within 1 hour following a single oral dose and can remain detectable for 7-21 hours after the dose2. 6-monoacetylmorphine (6-MAM) is found more prevalently in oral fluid, and is a metabolic product of heroin. Morphine is the major metabolic product of codeine and heroin, and is detectable for 24-48 hours after an opiate dose. The Opiates assay contained within the Salivaconfirm premium™ Oral Fluid Drug and Alcohol Screen Device yields a positive result when the concentration of Morphine in oral fluid exceeds the 40 ng/mL cut-off level. Tetrahydrocannabinol, the active ingredient in the marijuana plant (cannabis sativa), is detectable in saliva shortly after use. The detection of the drug is thought to be primarily due to the direct exposure of the drug to the mouth (oral and smoking administrations) and the subsequent sequestering of the drug in the buccal cavity3. Historical studies have shown a window of detection for THC in saliva of up to 14 hours after drug use3. The Marijuana assay contained within the Salivaconfirm premium™ Oral Fluid Drug and Alcohol Screen Device yields a positive result when the 11-nor-Δ9-THC-9 COOH concentration exceeds 12 ng/mL. The Marijuana assay contained within the Salivaconfirm premium™ Oral Fluid Drug and Alcohol Screen Device yields a positive result when the Δ9-THC concentration exceeds 75 ng/mL. Phencyclidine, the hallucinogen commonly referred to as Angel Dust, can be detected in saliva as a result of the exchange of the drug between the circulatory system and the oral cavity. In a paired serum and saliva sample collection of 100 patients in an Emergency Department, PCP was detected in the saliva of 79 patients at levels as low as 2 ng/mL and as high as 600 ng/mL4. The Phencyclidine assay contained within the Salivaconfirm premium™ Oral Fluid Drug and Alcohol Screen Device yields a positive result when the Phencyclidine concentration in oral fluids exceeds 10 ng/mL. Benzodiazepines are frequently prescribed sedative and hypnotic drug for the symptomatic treatment of anxiety, insomnia, sleep and seizure disorders. Most Benzodiazepines are extensively metabolized in the liver and excreted in the urine and saliva as metabolites. Chronic abuse may increase the risk of physical dependence and may result in intoxication, drowsiness and muscle relaxation. Oxazepam is the major metabolic product of Benzodiazepines. The Benzodiazepines assay contained within the Salivaconfirm premium™ Oral Fluid Drug and Alcohol Screen Device yields a positive result when the concentration of Oxazepam in oral fluids exceeds 50 ng/mL. The Oxycodone assay contained within the Salivaconfirm premium™ Oral Fluid Drug and Alcohol Screen Device yields a positive result when the concentration of oxycodone in oral fluid exceeds 50 ng/mL. Methadone is a long acting pain reliever producing effects that last from twelve to forty-eight hours. Ideally, methadone frees the client from the pressures of obtaining illegal heroin, from the dangers of injection, and from the emotional roller coaster that most opiates produce. Methadone, if taken for long periods and at large doses, can lead to a very long withdrawal period. The withdrawals from methadone are more prolonged and troublesome than those provoked by heroin cessation, yet the substitution and phased removal of methadone is an acceptable method of detoxification for patients and therapists5. The Methadone assay contained within the Salivaconfirm premium™ Oral Fluid Drug and Alcohol Screen Device yields a positive result when the Methadone concentration in oral fluids exceeds 75 ng/mL. Barbiturates are CNS depressants. They are used therapeutically as sedatives, hypnotics, and anticonvulsants. Barbiturates are almost always taken orally as capsules or tablets. The effects resemble those of intoxication with alcohol. Chronic use of barbiturates leads to tolerance and physical dependence. The Barbiturates assay contained within the Salivaconfirm premium™ Oral Fluid Drug and Alcohol Screen Device yields a positive result when the Barbiturates concentration in oral fluid exceeds 300 ng/mL. Buprenorphine HCl alone or in combination with Naloxone HCl. Therapeutically, Buprenorphine is used as a substitution treatment for opioid addicts. Substitution treatment is a form of medical care offered to opiate addicts (primarily heroin addicts) based on a similar or identical substance to the drug normally used. In substitution therapy, Buprenorphine is as effective as Methadone but demonstrates a lower level of physical dependence. 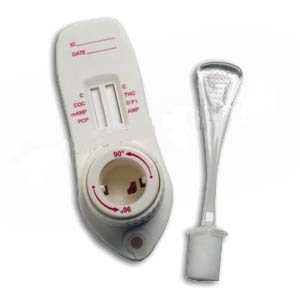 The Buprenorphine assay contained within the Salivaconfirm premium™ Oral Fluid Drug and Alcohol Screen Device yields a positive result when the Buprenorphine concentration in oral fluid exceeds 10 ng/mL. Alcohol intoxication can lead to loss of alertness, coma, death and as well as birth defects. The BAC at which a person becomes impaired is variable. The United States Department of Transportation (DOT) has established a BAC of 0.02% (0.02g/dL) as the cut-off level at which an individual is considered positive for the presence of alcohol. The Oral Fluid Drug and Alcohol Screen Device for AMP/mAMP/COC/OPI/THC/PCP/BZO/OXY/MTD/BAR/BUP is an immunoassay based on the principle of competitive binding. Drugs that may be present in the oral fluid specimen compete against their respective drug conjugate for binding sites on their specific antibody. During testing, oral fluid is collected on the alcohol pad and saturates the alcohol pad. If no alcohol is present in the oral fluid, the alcohol pad remains colorless (remains white or cream color) because there is no alcohol in the oral fluid to react with enzymes to start the color reaction. If alcohol is present in the oral fluid, the alcohol pad changes to green or blue color because the alcohol reacts with alcohol oxidaze to produce aldehyde and peroxide. The peroxide reacts with peroxidase in the presence of hydrogen donor to produce a blue color. Therefore, the presence of green to blue color at the alcohol pad window indicates a presumptive positive result for alcohol. The test contains membrane strips coated with drug- protein conjugates (purified bovine albumin) on the test line, a goat polyclonal antibody against gold-protein conjugate at the control line, and a dye pad which contains colloidal gold particles coated with mouse monoclonal antibody specific to Amphetamine, Methamphetamine, Benzoylecgonine, Morphine, Marijuana, Phencyclidine, Oxazepam, Oxycodone, Methadone, Barbiturates and Buprenorphine. The Oral Fluid Drug Screen Device should remain in the sealed pouch until use. The test device is for single use. The used collector and device should be discarded according to federal, state and local regulations. The oral fluid specimen should be collected using the collector provided with the kit. Follow the detailed Directions for Use below. No other collection devices should be used with this assay. Oral fluid collected at any time of the day may be used. Allow the test device to reach room temperature [15-30°C (59-86°F)] prior to testing. Do not place anything in the mouth including food, drink, gum, or tobacco products for at least 10 minutes prior to collection of oral fluid specimen. Remove the collection stick and test tube from the sealed pouch. Send the collector with collected oral fluid to the laboratory for GC/MS confirmation if necessary. Two lines appear. * One color line should be in the control region (C), and another apparent color line adjacent should be in the test region (T). This negative result indicates that the drug concentration is below the detectable level. Alcohol Negative Result: The alcohol pad shows no color change (remains white or cream colored); it should be interpreted as a negative result (no alcohol present). A result where the outer edges of the alcohol pad produces a slight color but the majority of the pad remains colorless should be repeated to ensure complete saturation of the alcohol pad with oral fluid. If the second result is the same, the results should be interpreted as being negative (no alcohol present). Alcohol Presumptive Positive Result: The Alcohol test produces a color change to green to blue in the presence of salivary alcohol 0.02 % B.A.C. or higher. At higher alcohol concentration near 0.30% B.A.C., the color may change to a dark blue-gray. A procedural control is included in the test. A color line appearing in the control region (C) is considered an internal procedural control. It confirms sufficient specimen volume, adequate membrane wicking and correct procedural technique. The Salivaconfirm premium™ Oral Fluid Drug and Alcohol Screen Device provides only a qualitative, preliminary analytical result. A secondary analytical method must be used to obtain a confirmed result. Gas chromatography/mass spectrometry (GC/MS) or gas chromatography/tandem mass spectrometry (GC/MS/MS) is preferred confirmatory methods. A Phosphate-buffered saline (PBS) pool was spiked with drugs to target concentrations of ± 50% cut-off and ± 25% cut-off and tested with the Salivaconfirm premium™ Oral Fluid Drug and Alcohol Screen Device. The results are summarized below. Test Total # of Test/Concentration B.A.C. The following table lists the concentration of compounds (ng/mL) above which the Salivaconfirm premium™ Oral Fluid Drug and Alcohol Screen Device for AMP/mAMP/COC/OPI/THC/PCP/BZO/OXY/MTD/BAR/BUP identified positive results at a read time of 10 minutes. The Alcohol test will react with methyl, ethyl,and allyl alcohols, but it will not react with alcohols having 5 or more carbons, glycine, glycerol, and serine. This property is a result of specificity of the alcohol oxidase enzyme extracted from yeast. A study was conducted to determine the cross-reactivity of the test with compounds spiked into drug-free PBS stock. The following compounds demonstrated no false positive results on the Salivaconfirm premiumΔ Oral Fluid Drug and Alcohol Screen Device when tested with concentrations up to 100 μg/mL. Reducing Agents: such as Ascorbic acid, Tannic Acid, Pyrogallol, Mercaptanalics and tosylates, Oxalic acid, Uric acid, Bilirubin, L-methyldopa, L-dopa, L-methyldopa, and Methampyrone, etc. The above-named substances do not normally appear in sufficient quantity in oral fluid to interfere with the test. However, care must be taken that they are not introduced into the mouth during the 10 minutes period preceding the test.